Zzzzzzap! Ahhh, the gratifying sound of another insect biting the dust on a humid summer night. The hauntingly seductive blue glow of the bug zapper attracts thousands of unsuspecting insects to their untimely demise. Phototactic creepy-crawlies simply cannot resist moving toward the light, and when they arrive, a 2,000-volt wire mesh awaits them. As handy as these tiny execution chambers are, they are not at all useful for farmers who are trying to protect precious stored grains and other crops from being eaten by insects. Instead, it is typical for farmers to control pests, such as beetles and moths, with insecticides. Because insecticides are toxic to humans, however, finding a substitute would be ideal. Now, such an alternative might exist. 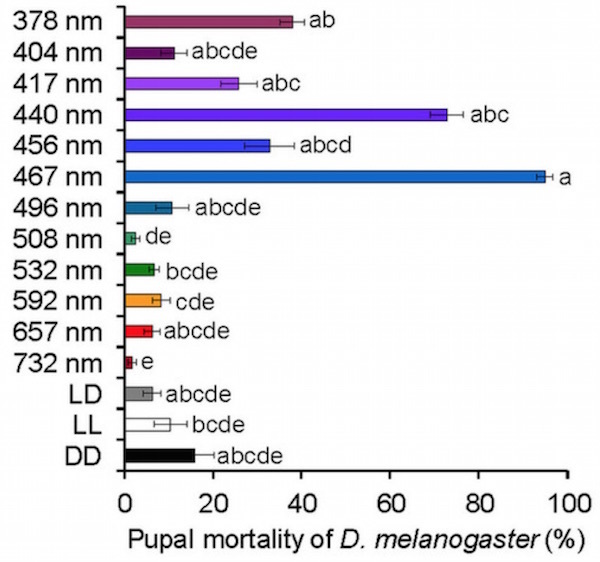 The authors went on to show that blue light (467 nm) also had a lethal effect on fruit fly eggs. Any adults that survived the light treatment had greatly reduced lifespans and produced fewer eggs. Similarly, other insects were killed by visible light, but at different wavelengths. The authors showed that pupae of the London Underground mosquito (Culex pipiens molestus) were killed by violet/indigo light (417 nm), while pupae of the confused flour beetle (Tribolium confusum) were killed by several different wavelengths of light, ranging from violet to blue. The authors conclude that lethality due to visible light is wavelength-dependent and species-specific. In other words, some kinds of light kill some types of bugs, while other types of light kill other types of bugs. Additionally, previous research suggests that the insects are dying because blue light likely triggers the production of reactive oxygen species, which damage important cellular structures and molecules. An obvious benefit from their research is that farmers could use this knowledge to kill certain species of pests, while leaving friendlier insects unharmed. It would also have the benefit of reducing pesticide use. The downside is that multiple wavelengths of light (and hence, multiple LEDs) would be required to kill all of the pests that threaten farmers. Thus, UVC light, the most lethal type of UV light, would be far more efficient at killing insects. However, UVC light itself has drawbacks, such as its indiscriminate killing of insects and toxicity to humans and other mammals.